The Duke and Duchess of Cambridge joined the Queen and other royals at Buckingham Palace today for a reception marking the 50th anniversary of the investiture of the Prince of Wales. The event marked the perfect occasion to celebrate the milestone with Her Majesty, Camilla, William and Kate, Harry and Meghan and Princess Anne. Princess Margaret's children the Earl of Snowdon and Lady Sarah Chatto were also present. 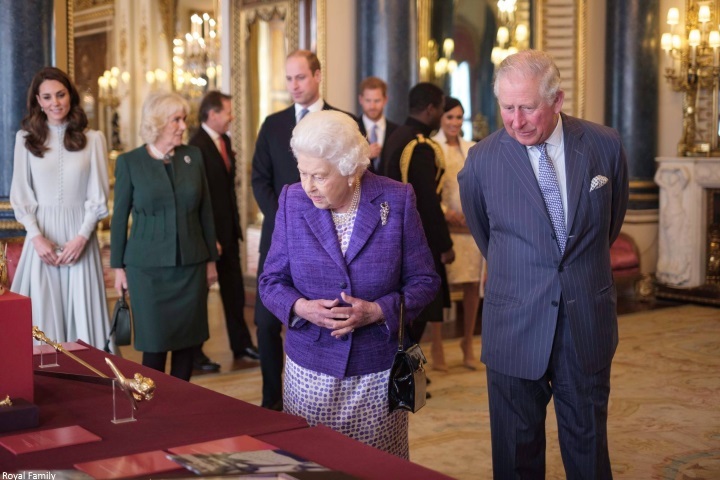 The reception marked Charles' decades of service to the UK and Commonwealth and an an opportunity to celebrate with a range of Welsh charities, organisations and businesses. Prince Charles was created Prince of Wales aged 9 on July 26th 1958 and was formally invested with the title by the Queen on July 1st 1969 at Caernarfon Castle. Before the Investiture, Charles spent a term at the University College of Wales at Aberystwyth, learning to speak Welsh. 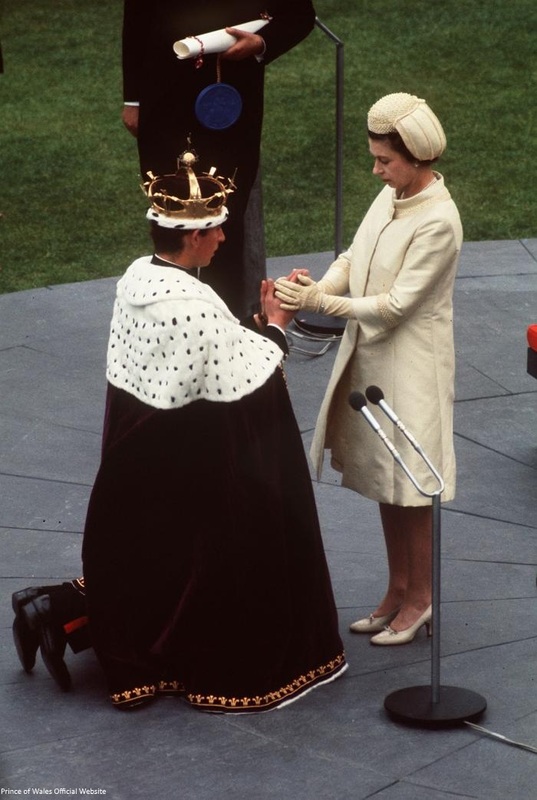 During the Investiture ceremony, after Prince Charles had the coronet and robes placed on him, he pledged his allegiance to The Queen with the words: ‘I, Charles, Prince of Wales do become your liege man of life and limb’. 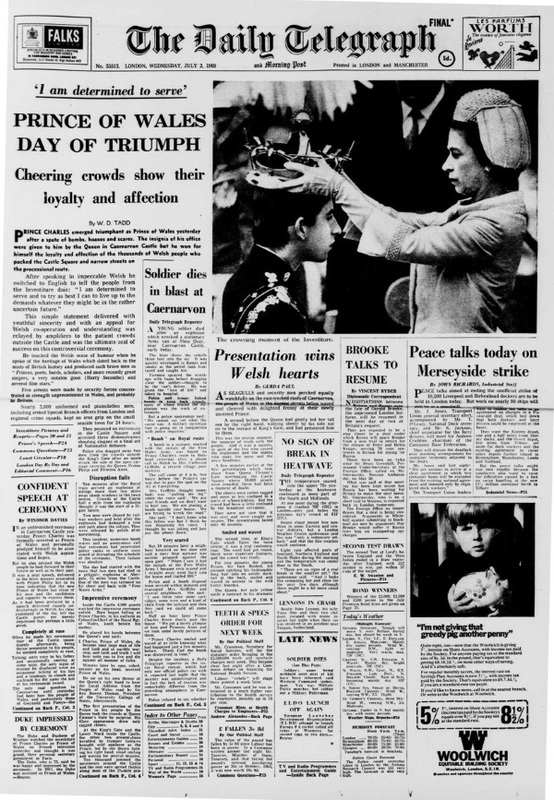 Hannah Furness shared The Daily Telegraph cover from the day of the investiture. In 2017, Charles became the longest serving Prince of Wales in history. 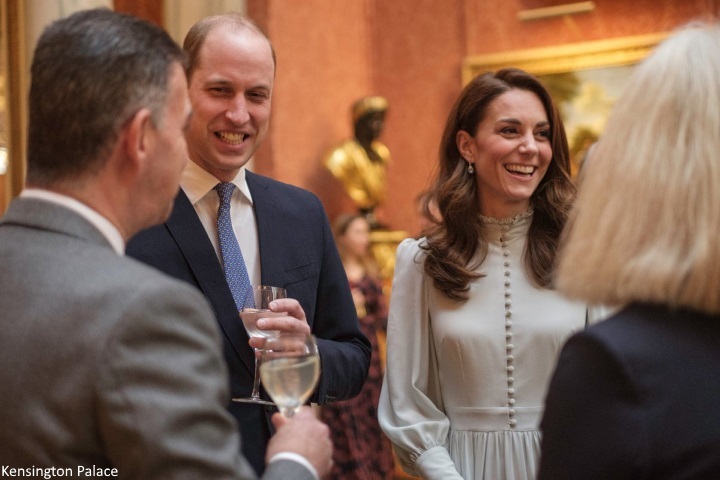 Guests included leading figures in Welsh and UK public life, as well as representatives from the Prince of Wales’s many Welsh charities and patronages, including The Prince’s Trust Cymru, Llangollen International Musical Eisteddfod and the BBC National Orchestra & Chorus of Wales. 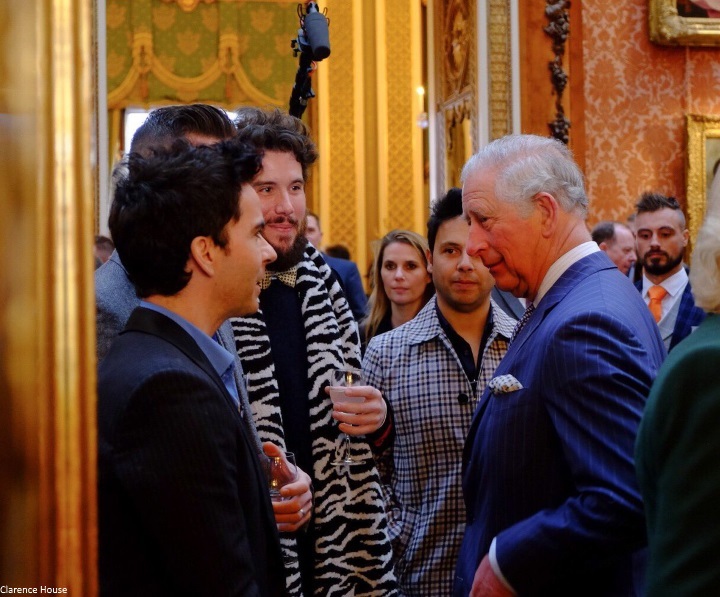 Prince Charles with members of Stereophonics. Camilla, wearing a green dress by Bruce Oldfield and the Prince of Wales Feathers brooch, met members of the band. One member of the band, Adam Zindani, spoke to the Duke of Cambridge, who joked about using the police lights to help him get Prince George to school on time. The Duke and Duchess of Sussex meeting guests. 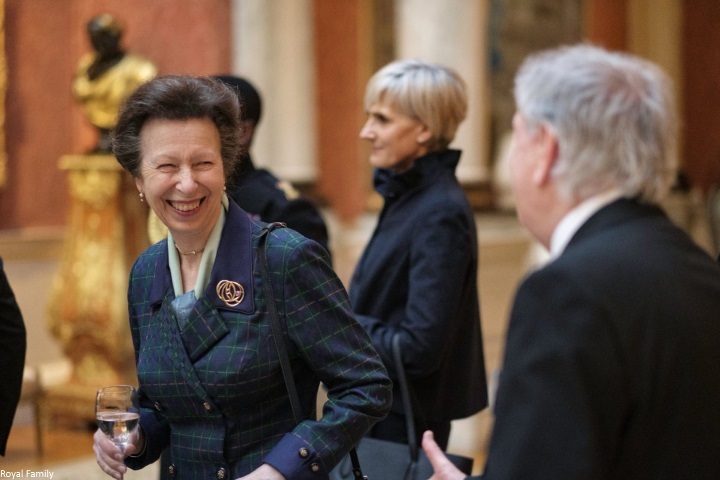 Princess Anne enjoys a joke during the reception. Kate's private secretary Catherine Quinn can be seen in the background. 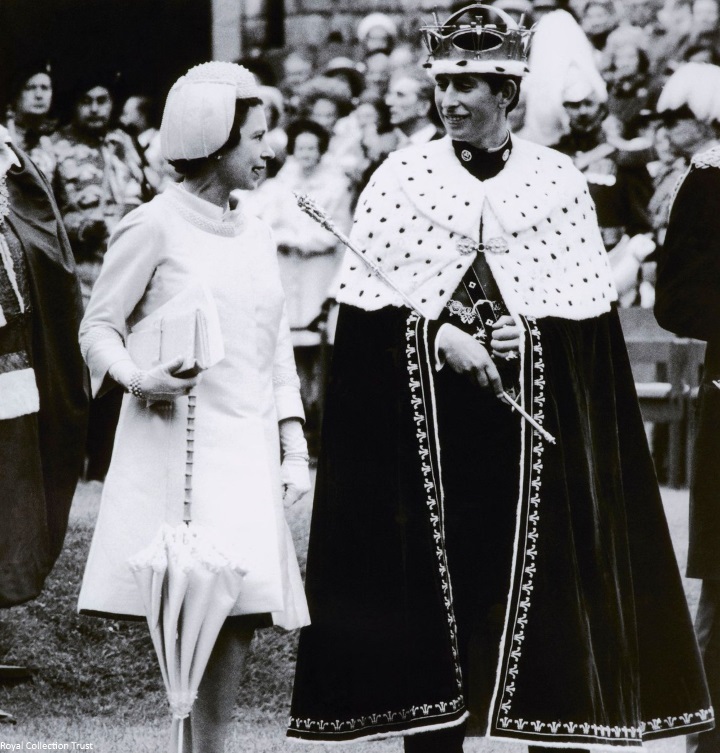 The royals viewed investiture regalia worn by the Prince of Wales in 1969. Items included the Investiture Coronet, Sword, Ring and Rod, as well as the Letters Patent for the creation of Charles, Duke of Cornwall as Prince of Wales in 1958. 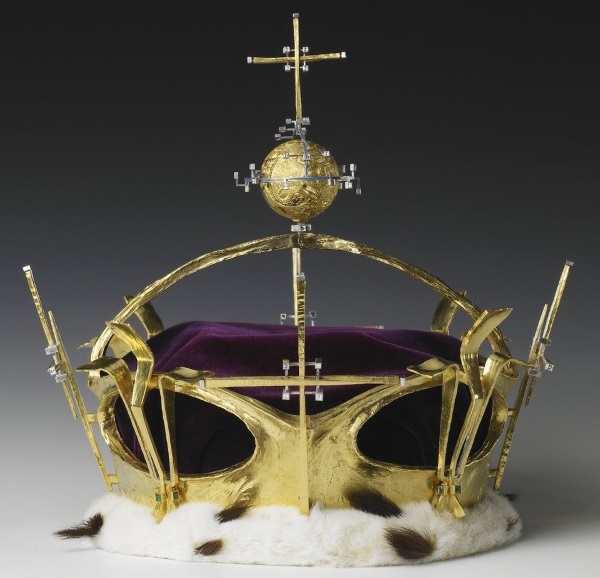 The Investiture Coronet was designed by the architect and goldsmith Louis Osman (1914-1996) and given to The Queen by the Goldsmith’s Company for The Prince of Wales’s Investiture. The Royal Collection Trust shares more information: "It is 24 carat gold, with the 4 Crosses Patées and the 4 fleur-de-Lys made from a nugget of Welsh gold, reinforced with platinum and decorated with diamonds and emeralds. The orb mounted on the top of the arch was engraved by Malcolm Appleby with The Prince of Wales’s insignia. This is surrounded by 13 diamonds arranged as the constellation of Scorpio, The Prince of Wales’s star sign. The diamonds set horizontally represent the 7 Gifts of God on one side and the 7 deadly sins on the other." 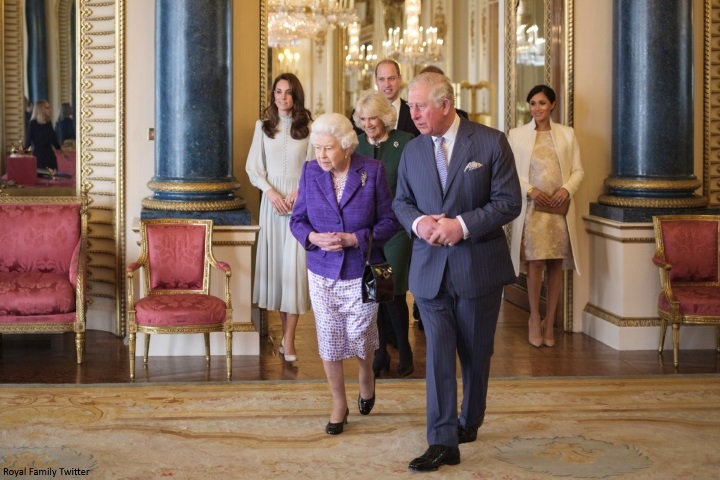 The Queen looked wonderful in a purple dress and jacket by Stewart Parvin. You'll notice her dress perfectly matches Charles' tie. 'Never in the history of the role can there have been such dedicated service, such honourable fulfilling of the promise at the Investiture, ‘I, Charles, Prince of Wales, do become your liege man of life and limb and of earthly worship, and faith and truth I bear unto you, to live and die against all manner of folks. Service was in the oath, and service has marked the 50 years, service often publicly unnoticed, unseen. A role has been imagined and developed, different to that of the Sovereign, probing, asking, suggesting and prompting, yet always in the service of Crown and country, under God. The Investiture was unique. Seldom can a coming-of-age have had such a setting; seldom can the weight of expectation have been so great. 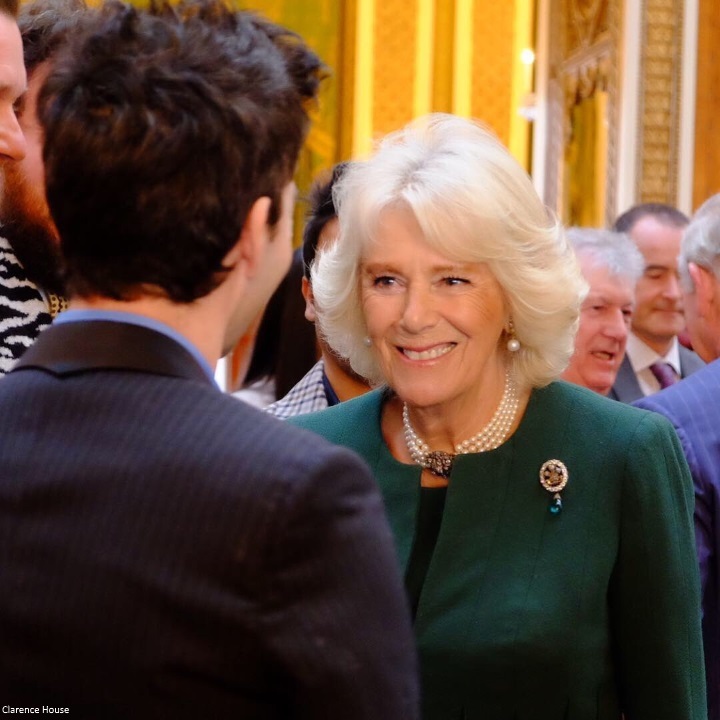 The reception culminated with a musical performance in the Ballroom by students from the Royal Welsh College of Music and Drama, of which Charles is patron. Below, a video from the event. 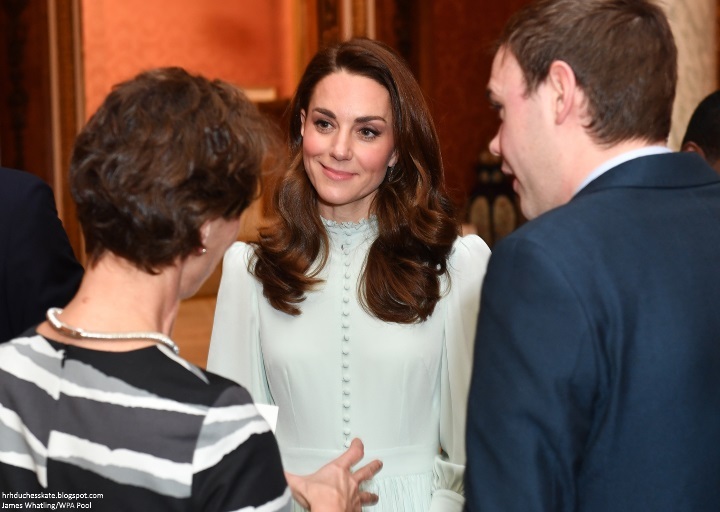 The Duchess selected a pale blue midi dress with a high collar, full skirt and loose sleeves with a fitted cuff. Several of you noted similarities between the piece and Kate's Beulah London Sabitri dress. The dress is not by the brand. The Palace confirms the piece was custom made by Kate's private dressmaker. Over the years, the unnamed dressmaker has created a number of items for the Duchess. There's been speculation regarding the identity of the individual ever since. It's been suggested the items may be private gifts from Sarah Burton (certainly, today's dress could have easily been McQueen). Other suggestions include the Queen's assistant and dressmaker Angela Kelly. It's also possible Kate works closely with a dressmaker who alters her clothing and perhaps creates pieces for her now and again? Very interestingly, a What Kate Wore reader named Rosie shared a dress by Russian designer Ulyana Sergeenko which is practically identical. 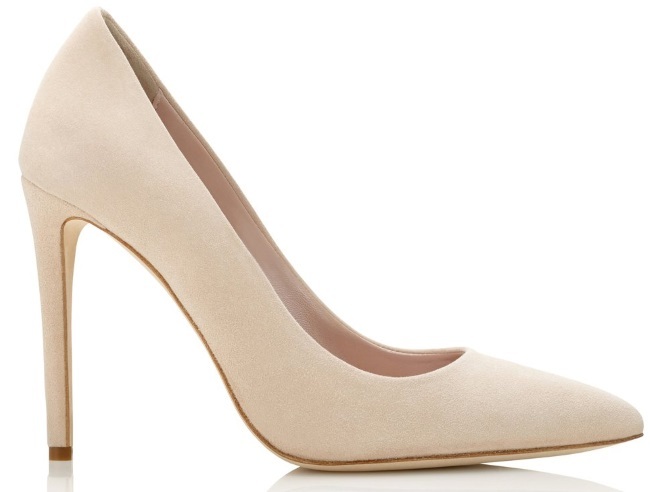 Kate's new pumps are the Emmy London Rebecca Blush style (with thanks to Middleton Maven). 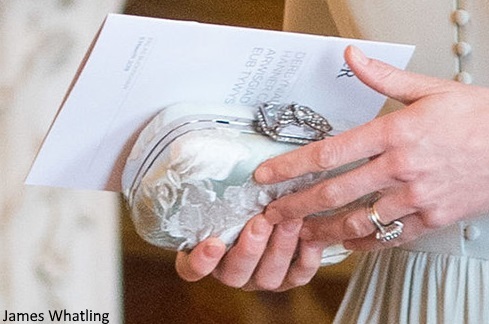 Kate carried her soft blue Alexander McQueen clutch. And accessorised with her aquamarine and diamond earrings. In other news, Kensington Palace confirmed we'll see the Duke and Duchess at the annual Commonwealth Day service at Westminster Abbey on Monday. Before that, the couple have a busy day of engagements in Blackpool tomorrow. They are expected to arrive around midday. Nice that this is the second high profile recognition of Charles in just a few months (his birthday in November being the other one). Whether they realize it or not (I'm sure they do) it helps to get his "brand" out there so we, psychologically speaking, might have an easier time with the dreaded transition (dreaded because of my love for the Queen and sadness at being at the end of the second Elizabethan Age). Interesting, Nicole! Thanks for telling me about Tony Armstrong's involvement. I'm more and more interested in Princess Margaret and her life lately. I was just thinking the Queen's hat looked sort of like a take-off on a Juliet cap, a bit of a mash-up between the Elizabethan period and the earlier medieval period. Wow, this washes her out and the shape is very granny. Lovely hair though. With that class and silhouette, this looks princessy not granny, to me. I agree entirely. It’s not awful but not a flattering look for her. An unlucky choice, granny is probably a good description. lol, you must have some very hot grannys! my granny could never have gotten into this dress when she was an actual granny. I for sure don't think kate's shape is granny, (unless slim and lean mean granny all the sudden?) to each their own I guess. Agree that is does have a "too sweet" or "granny" vibe, or my first thought a nightie. The drape of the fabric is nice but the color, ruffle, puffy sleeves and longer length is too much. Hair and make up very pretty. Anything is better than the yellow/floral Erdem gown from Sweden (shudder). I still haven't gotten over that one. These very pale colours really do not do anything for Kate. This sea foam green is esquisite in the Duchess, her real grace and charm shines through! I agree. Pale colours do wash her out a lot. This look is sadly way to frumpy for my liking. Good thing: she can still recycle the dress when she is 50 (like P Anne). Can’t wait for the midi trend to be over. This dress combines almost everything I don’t want to see her wear (the only thing missing is a hideous print and ruffle mix aka Erdem). Wait until you get to 50. You'll change your mind! I thought this was a repeat of the Beulah dress Kate wore on tour but without the scarf. However, it looks longer and the neckline is different so I guess it's another one she liked so much she bought it twice. Different neckline, almost identical dress, yes it's Kate. Why does she have to dress trendy? She is not a celebrity walking on a red carpet neither an it-girl. By the way, it all depends on what you consider trendy. If trendy is short, bodycon dresses I am happy she does not follow the trend. As for her dress, midi length has been in style for years now and still is. And just have a look at the biggest clothes company, Zara, and check how what you call shapeless dresses are everywhere in their stores. Ivy Lin, agreed. I can only assume that her goal today was to not draw much attention because the event is all about Prince Charles. To look proper and presentable, but not "omg! stunning!". She doesn't have to be trendy but she also doesn't have to wear granny collars and Victorian buttons either especially considering the flattering clothes shes worn in recent engagements. To be fair, granny collars and Victorian buttons and midi lengths are all very trendy right now! While the style of dress she is wearing is technically called a "granny dress", def: "A granny dress was a long one-piece gown or dress that was popular with young women in the United States and Britain in the mid-1960s to the 1970s. Granny dresses were loose-fitting and often printed with light or pastel colors. They had a vaguely Victorian-era feel to them"; Rebecca is right, this look is popular with designers and still on trend, its even called "granny chic"! Also be forewarned that one of the 2019 winter looks is, headbands, yes the very ones that Kate has worn of late!! So actually Kate is quite on trend! I love love love Kate and she usually looks stunning... but not her best look today. Her hair looks flat today, maybe it’s the angle of the camera, otherwise beautiful! Kate looks just lovely. I love her penchant for flowy, romantic, and feminine silhouettes as opposed to trendy looks. Like others have said, it reminds me of the Beulah gown from an earlier tour, which was also a favorite! Classic feminity, and just lovely. It was so good to see Charles’ family out to support him on this anniversary. They all looked lovely, polished, and happy to be there. How amazing that Charles has been Prince is Wales for such a long time. Kate needs a professional stylist. She is gorgeous, but the look could be so much improved. Most important, she needs to develop her best color palette and stick with it. The pale colors do not suit her. Unknown, agree most of the pale colors we see her in, at least when photographed, do not work with her coloring. I am often not a fan of her style but agree that the colors are often the big miss. Maybe Kate did not want to bring a lot of attention to herself. Catherine Cambridge is a beautiful young woman, yet she dresses like an old lady sometimes. I don't get it. You can be classy and demure and not wear something like this with its high neck, long sleeves and unflattering length. Not to mention the boring shade of whatever. You know, I think she's been in the public eye for so long and needs to come up with new clothes all the time that check a lot of the same boxes, so variety is hard. I think she does well considering. Kate is always pretty, but "matronly" is a word that seems to be describing more of Kate's fashion choices of late. I think there are too many elements of the matronly look that are in this dress; had she stuck with one or two at the most it wouldn't have come off so prim and proper (distinct from appropriate and modest). For example, keeping the length (her favorite right now) and the buttons, or keeping the high neck with tight sleeves and no masses of buttons, might've done the trick. Just TOO many elements here and I think that's the problem. Each element on their own are nice (although I'm not a fan of the collar--again, too many elements--make it high and simple, or lower w/ ruffles, but not high AND ruffled). Not all her choices of late...there have been quite a lot of wonderful outfits recently. Yes she's had some excellent pieces, but "matronly" is a word that does come up now than when she first joined the family. That's what I meant---not implying that all her outfits are matronly. N. Ireland tour was a great example of being fresh and *not* matronly. 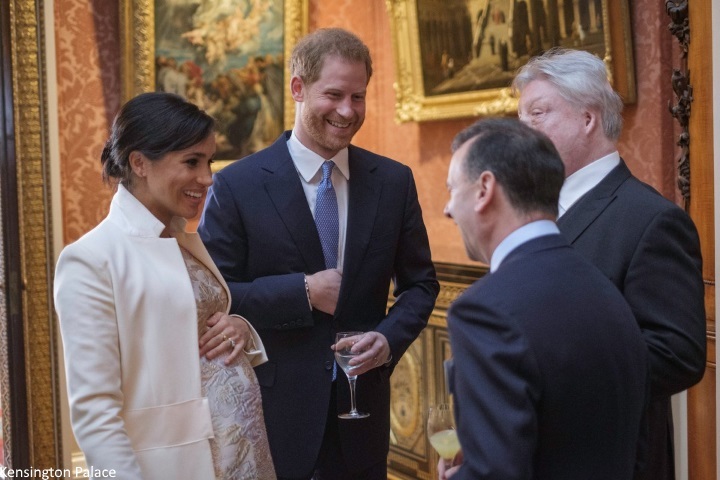 I think really, what the issue with this dress is that it's very 80's (which of course hearkened back to Victorian times with the collars and shoulders (Diana was a fan), with the added aspect of all those buttons. This isn't a great look, unfortunately. But, the day isn't about her, so maybe her attire was meant to be conservative and bland. Beautiful and romantic. Kate looks wonderful. I think she styles herself and shows her personality. No need for a professional stylist to erase who she really is. Thanks, Charlotte. I’ll be back later to view the full post. Not my style—but she does look lovely and appropriately dressed for the occasion. I don't love this color (I think it washes her out, sadly), but I love the cut and style of the dress. I think her hair looks lovely, she just maybe looks a little tired (girl, me tooooooo). Agree. She can usually wear the icy tones, but something isn’t working here. The dress style is pretty and as others have said, her day look. Is she tired, or IMHO too skinny and that is making her look withdrawn lately? I would like this look more if she wore an edgier shoe with it. It's pretty, but it's youthfulness is determined by the accessories. These shoes, just no. PREACH! She has never tried to be a fashion maven. If people follow her because of it, they will always be disappointed. Her style has evolved into a work uniform and a more causal look for her "private" life. Aren't we all a little like that? I agree! Her style is classy and timeless, that's why I follow her. She always looks polite and appropriate and she doesn't need to follow rapid changing fashion. Agree, she has a wonderful style, elegant and timeless and has the knack of always being dressed for the occasion. And she always looks pretty! I agree +3! Catherine's style is chic, timeless, subtle. She's the future Queen! Her style also allows her beautiful face, hair & figure to come to the forefront - she seldom lets her clothing wear her. Since this blog is, for me anyway, mainly about the fashion, I'm puzzled that other fashion followers don't realize that midi skirts and the vintage/Victorian vibe are in vogue right now - especially in the UK..
Thankyou for saying what I was thinking 🤔 and putting it into words. She looks elegant and lovely and I’m so annoyed with some people’s comments. She is staying true to her style. This dress is more or less her day look — not the most flattering, but it works well in these “work, but elegant celebration” situations. As she gets older, she will most likely wear more suits. 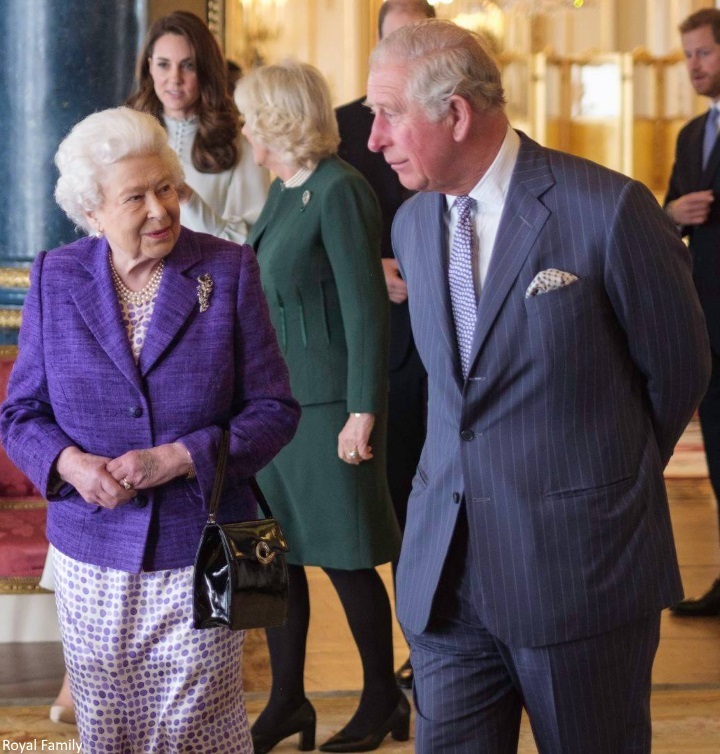 I like the way she matches with Camilla while William matches with Charles. In these tense times, it is refreshing to have some consistency in the clothing and to avoid flashy outfits. Royals must show themselves as a bit above the fray and carrying on with proper decorum. Leave the glitz for evening. Not sure what you consider ‘her true style’. The skinny jeans she often wears on engagements that require a casual attire? The short dresses (suits) she also often dons (see Oscar de la Renta magenta suit recently repeated)? Because I don’t think those match this choice of an outfit. I believe this dress is not flattering at all for Catherine, and she could find in her existing wardrobe plenty of better options, that would not steal the thunder from Charles, but wouldn’t wash her out either. And those shoes are (in my opinion) becoming a liability. They are quite awful and almost any other shoes would be better. I have all the respect for Catherine, often like her sartorial choices, but this isn’t one of those times. Also, I do believe she needs a stylistic makeover. And she should hire a professional for that. It would help balance her looks (so they are less all-over the map) and give her a style identity that can reflect her personality and be respectful of her role in the family. Doubt she would wear "skinny jeans" to a reception at BP so why mention them? Kate's style is geared toward appropriateness to event; one style does not suit all events. She has a style for casual, sporty and another for receptions, church for example. She generally wears opaque tights with her shorter skirts and I don't think she wears short skirts to WA.She is not the only royal female to wear skinny jeans for sports, outdoor occasions, by the way. Call her outfit vintage or "granny, frumpy, aging, unflattering, boring, dowdy...," she is always dressed for the event . AT least she was not in copycat suit- top, pearls, and brooch. Using those labels is not necessary to communicate that one does not fancy an outfit. FYI- these are new shoes, as Charlette clearly stated. Not the "brown socks." Already becoming a liability? They are quite stylish and up-to-date. I have noticed that when a Kate outfit is disliked, it is Kate's fault- she needs a stylist. When she is meant to be a focal point at an event and pulls out all the stops, Kate gets no credit- she must have a stylist. I think there is an urgent need to update criticisms so that they reflect actual, current circumstances-not to mention, it would be helpful for critical commenters to have the courtesy to read Charlotte's post instead of making remarks that clearly indicate her writing was ignored. She puts a great deal of time and effort into her posts. They deserve to be read. On another subject: Parliament is actively considering doing away with male primogeniture in title inheritance for the aristocracy, not just when applied to the succession of the monarchy. Beatrice could be Duke of York if absolute primogeniture is made the law!! Call me crazy-I have fretted about the future of the title, as it looks as though Andrew has no plans to marry a much-younger woman and produce a male heir. Would Anne come ahead of Edward and Andrew as well? What an idea! I wonder of the law would be retroactive and would it apply to succession other than the monarch? She has been heavily promoted lately, along with Charles. All of a sudden she is everywhere, accompanying HM. And several photos of a smiley Anne featured recently. I don't buy the explanation that Edward and Andrew were missing today because they did not attend the ceremony in 1969 and Anne did. My royal shenanigans radar is alarming. Actually, I said **“true to her style”**. The word “her” should be in bold. As you correctly indicated, she has many dresses in her closet that are similar to this one in style — specifically the high neck, lots of buttons, chiffon-ish skirt with pleats, etc. We have seen very similar dresses throughout the years. By this point, I feel I know what Kate will wear at certain events. She has rarely varied, except her evening looks. If this is what she likes and feels comfortable in, then I say cheers to her. She has an excellent figure, beautiful face and looks great in many styles, but she seems to prefer this style of dress for these type of events. So be it. It is appropriate and pretty. She seems steady and stable with little to no interest in shocking us with her fashion choices, much like the Queen, Camilla, Anne, etc. Yes, it probably disappoints the designers, but it tells me she knows herself and likes what she likes. It is refreshing that she stays true to her style, not someone else’s. Bravo and kudos. Hmmm. I think Kate is quite capable of making a statement when she needs or wants to (I offer the recent BAFTA event as evidence). In other words, whatever Kate is doing, it generally works whether she has a stylist or not (to an unfair degree I might add - tall, slender, beautiful, knock-out smile, genuinely nice, athletic, wonderful mother...the list goes on). But, while I did read the shoes are new, I wanted to see something beyond the neutral pump especially on the heels (so to speak) of the Ireland trip. It’s sort-of like, once you see how truly amazing Kate can look all decked out, you want her to look that way all the time. But this would not be fair - even Hollywood stars with verified stylists have down days. The fact Kate looks tired sometimes means she’s mortal like the rest of us and, maybe, even with all of the money, jewels, and real estate this RF thing is harder than it looks. Regarding male primogeniture full disclosure I am an American and I do not pretend to understand the full import of the English rules of succession. But, and I’m wincing as I write this, why would Anne inheriting a title previously reserved for men be a problem? Shouldn’t she be just as entitled as her brothers? Similarly, why would Princess Beatrice inheriting her father’s title be a problem? I also find it sad that Andrew and Edward was not there. Just imagine if in 50 odd years Harry & Meghan is not invited to something celebrating William? It just seems wrong. As far as the law on inheriting peerages go, this is the third or fourth time it has been introduced but it has never gotten far. Hopefully this time something would come of it. But even if it does, I highly doubt it would be retroactive. There are too many peerages that reverted to the Crown because there was no male heir. If the law is retroactive all if them will have to be returned to female heirs, causing chaos with inheritances being disputed etc. I am afraid the change in law will be to late even for Baby Sussex, should she be a girl. That is why I said "actively," Rachel. It never made it out of committee before. Yes, huge chaos, but so is Brexit. There were innumerable stories through the ages like Lady Mary's of Downton Abby. First born daughters were put out of their homes upon their married younger brother's assumption of the title, usually entailed with the property or the passing of the title to a distant male relative. The daughter's only recourse was to marry well. Sense and Sensibility, anyone? Male primogeniture reflected an attitude and way of life that affected all strata and circumstances By retroactive I just meant for those already born but for titles as yet not due a change in hands. Beatrice, for example. With the end of male primogeniture in the monarchy succession it did not apply to those already born but to those not yet born. It was timed to include a future child of William. That law had to be approved by all countries for whom Elizabeth II is Head of State. I think Australia was the last to approve. I love her hair today! Those big waves are so voluptuous! I don't mind the dress. I like the button detail and like the sleeves as well. the skirt looks like it would have a nice float when walking and I like the shoes. curious about what the handbag is. she looks happy and healthy and good. I think she nailed it for this occasion, This event is not about her. I'm thinking she picks the "impact" of her clothes per occasion. for instance this event is all about PC so why oh why would she want to wear something so fabulous it takes away from him, especially with all the speculation surrounding him being jealous of others getting attention etc. it seems to me that is what she is doing here, and doing it well:) will await further updates! On another note, is Charles the longest reigning Prince of Wales ever?? I don't find this neckline to be the most flattering for the shape of her face. The minty green color is lovely. I'm sorry but I'm not feeling it. To me it's pretty reminiscent of the Duchess of Windsor's wedding dress. I personally do not favor the high collar, Victorian look. But I think the reason for that is that I have the body type that just (I feel) does not support it. I am not nearly as tall and slender as Kate. She is built very tall and delicate and I think she out of anybody can pull this look off. It’s looks much less confining and stuffy. I think this style IS trendy however, I see it in a lot of fashion magazines. But what I think a lot of people would like is a trendier shoe or accessories to kind of throw it into a more modern edge. But that is not Kate, at least it’s not Kate while on the job in Buckingham Palace. She likes classic jewelry sets and with the frillier dress it can veer into “granny”. But her hair is very loose with waves and not in a low chignon, she has chic spiked stiletto heels, not a low black block heel. So I think she is far from granny and firmly in the romantic setting. It works for her, and I think it’s just a stage she is in. In another 5 years she might be into another trend that is fitting for the position she is in! I'm sure if Kate desired, she could wear something that would overshadow everyone in attendance and impress us all. The truth is that she knows how to look great and still be the future queen that she is. Like someone else noted, this is not a fashion show, it is a Royal family celebration. Yes, she is truly a classy Duchess and know how to dress appropriately and not over dress and to always be modest and refined in all that she does and wears. According to Rebecca English, this dress is by a private dressmaker. Not my favorite look but Kate looks appropriately dressed for the occasion. I'll wait for more pictures, but the dress looks a little too twee for me, I think. I find this so interesting. To date myself, I first started following the BRF when Charles was investured as the Prince of Wales. I was a young girl in the US, and got up early to watch the ceremony. Since then, I have gotten up early to watch weddings, birth announcements, anniversaries, funerals ... basically, anything that is broadcast in the US. I have always been a fan of Charles, even during the worst Diana days and even while admiring her. I wish him the best as he continues as PofW and his future ascension to the throne. A lovely graceful dress, so appropriate for an elegant daytime reception hosted by the Queen. It fits Kate impeccably. I like the simple accessories and her hair style. But Kate's face looks tired, as though she lost sleep last night. It is a lovely dress and perfect for the occasion. Not a wow moment like I had with the sparkly mint dress in NI but she looks great. I think she is dressed very appropriately for the occasion and her position. This dress will stand the test of time. In 50 years when they show pictures of her from today, it will be like looking at pictures of the Queen from 50 years ago -- very classic and appropriate. Wish she had worn something more vibrant. Perhaps a nice jewel tone. Those colors suit her well. I think the sleeve is very Victorian and the midi length adds to that feel. Along with the tiny buttons and high neck. I think that is where people are getting the granny vibe. It probably would have worked well in a deep green or teal. Or even a dark plum or garnet. It’s too similar of a color to the missoni she just wore in Belfast. But at least that had fun sparkly thread. She really does love a gathered sleeve. Her hair is perfect as always. I think this dress is too '80's for me. That collar in particular is very '80's, reminiscent of Laura Ashley, imo. The one she wore on tour some years back to the mosque, was better--less "fussy" and thus less matronly (although the more I think about it, the more I think it's the 80's vibe that just bugs me). The color is hard to make out too--something a bit darker would've worked better. Has anyone else wondered if her 'private dressmaker' could be Carole, Pippa, or even Kate herself? I wondered about that with the yellow eyelet dress in Australia but IMO while the design could be Kates, the execution here is impeccable and professional, implying a experienced dressmaker, not an amateur. If it is they have some secret training because as Natacha said, the technical parts are impeccable! I triple-agree with this comment. She's still young and fabulous. I understand not wanting to take away any attention--but there's a way to do it while still being stylish or fashionable. I used to love Kate's dresses but this time, it's a big miss for me. The dress is not flatering and Kate is way too thin in that dress. Okay, so Kate's private dressmaker (whoever that may be) copied the Beulah dress. Because he or she is not a designer. I think Kate should stick to designer dresses. Not necessarily. I design and sew my own dresses, but I don.t follow designers, so I know nothing about what.s being designed. I only do what i like. Maybe the design is by Kate. Maybe she wanted the Russian dress but for political reason she could not, so asked for a similar design to a dressmaker. I’m a bit meh on the outfits from today. Thanks, Charlotte for the history lesson on the Prince Charles’ investiture, Prince of Wales. Though not my favourite looks, I'm guessing she wanted as little attention on her as possible today, as it was Charles day. Always lovely to see her and William together. And she still has the loveliest of smiles ! I am not a big fan of these blousy midi dresses that Kate seems to favour for this kind of reception. But she likes them and they do kinda work with the tricky dress code. However of all this type of dresses she owns this one is my least favorite. As somebody said, there are just too many elements and colour washes her out. Last week she showed that she could pull off a seafoam-minty colour but this is a slightly different shade and that makes all the difference. I am however fascinated by the “personal dressmaker”. My guess is that we will see Kate (and maybe Meghan) make use of this option more and more. It takes the focus away from her clothes because there are no repli-Kates and Kate-effect and it also solve lots of problems when it comes to cost. Let’s be honest, Kate could employ a dressmaker fulltime and her salary would be less than two or three of the high-end designer outfits. Disappointed in this dress. Looks frumpy and dose not justice to Kate at all. I agree KiwiNic. Sometimes she selects styles that are just too old for her? It's not even a matter of conservative or not - the lack of color and this style is a total of miss for me. Having said that, Charlotte your posts are so robust and informative! Thank you as always!! If we’re commenting on appropriateness, I think Kate nailed it. But I would have liked to see a different shoe. Especially when pairing dress and clutch the shoes don’t work as well. I don’t get the granny vibe, though. Kate has the right frame for this dress. I just do not think Kate is that obsessed with fashion. Not her main priority. She also may have wanted the spotlight to be on Charles and not on a new dress she is wearing. I think she is very sensitive to the occasion and who it honors. She is not trying to outdo anyone She has already won! I love the moment on the video at 1:48-1:50 where Kate shares a brief laugh with Meghan, and how the family is attentive to Meghan feeling comfortable at these events this first year. Her dress seems flat and it's the first time I feel that Kate looks washed and tired.Looking at the similar one by Ulyana Sergeenko I think that something in the execution and styling is missing from Kate's look but still I prefer her wearing this than LK Bennet dresses.she should stear away from brands with bad management . The press blaming her for all the failure of those brand pained me and I think she may feel hurt that business closing and people quitting job when she championed those brands and loved them . I think the press linking her to LK Bennet was a perfect example if how they use the duchesses to create headline. It has always been done, will always be done and my guess is they just ignore it. Not sure if Kate is laughing with Meghan or the male guest she is talking to, but perhaps they really are close friends. Kate looks nice but the high collar is a bit matronly and she does look a bit tired but who can blame her with her schedule. Meghan looks lovely too in fact all the royals do from Princess Royal to Her Majesty. To my mind, Kate is wearing one of her standard dresses, which always make her look very tall and slim (which she is , of course). She seems to love all variations of the shirt dress and sleeves. You see Kate wearing long cuffed sleeves often, and the dress is always completely buttoned. Just observing that Kate and Meghan are both carrying evening bags, while the queen and Camilla are carrying handbags, and wearing bright or deep colours while Kate and Meghan in pale colours or white. They don't look at all coordinated like they were at the Commonwealth service of last year. Since Kate's dress is supposed to be done by her private dress maker, I wonder if Meghan had someone run up a nice maternity shift dress in some great fabric. Amusing to imagine that. I was thinking it might be another vintage piece? Perhaps my own style skews granny-ish, but I quite liked Kate's dress today. It was perfectly fitted, and I even liked the color. I know it is not on trend, but I would actually like to see a little more color on her lips. That might help with color issues. I also loved her aquamarine earrings. I thought both Meghan and Kate looked very nice today. Well done ladies! Could we come up with a different term than “granny”? I am a granny. There is no way I would ever dare to wear a dress like this. It would look worse than silly. My granny friends would not wear it either. Yes, it is a Victorian look. Yes, it is an aristocratic look. Yes, it is indeed regal. No, we can’t all wear it. In our daily jobs, most of us can’t pull off the Queen’s look, or Camilla or Anne, either. Why should we expect Kate to wear some sort of “swag”? To me, the point of royalty is be rare, special. Too trendy, too fashion-y puts the royal on a slippery slope. Keep the mystery, keep the magic of royalty. Anon 00:47 - I agree about the "granny" and tried to make that point further up but you were much more concise!! thank you! Anon 00:47, thank you for your comment! I am not a granny but I don't think it's fair to use this term. There are so many types of grannies, some look classical or conservative, some wear polyester stretch pants :), some are youthful and stylish - but Kate doesn't look granny-ish at all. That said, today's look is not my favourite but she looks nice and appropriate. Thank you so much, Charlotte, for the post and for the history you included. Your posts couldn't be better IMO! Walking down Memroy Lane today ....I think the dress is too old fashioned looking because I wore this exact style and this color for a school dance. The fabric was a stiffer polyester blend, it was the late 70s. It was floor length. I borrowed it from a cousin. I wore it the following year to a wedding. I love the style of the dress, but would have liked a darker color. If the color was to let the queen, Charles and Camilla be the stars, as it probably was, then it was perfect! I would like Kate to wear darker lipstick, as someone else mentioned. Just a lil' quibble. She's still my favorite royal! I would rather have seen the Beulah again. It is much nicer. The two dresses are so similar I am not sure what the point of ordering the second one is. I agree. Her Beulah is prettier to my eye and would have been a nice repeat! Is 'private dressmaker' perhaps camouflage for a Russian designer Kate did not want to advertise? Those dresses are identical, except for the fabric and the hem treatment, and they even include details like buttons on the belt. I have a hard time believing Kate's is a copy. I still like Kate's look, and also Meghan's. But the Queen, Camilla, and Anne were in daytime separates and suits. Though lovely, Kate ended up looking a bit over dressed. I wonder whether her dress was perhaps an alternate for the Northern Irish reception, and she wanted to wear it for something important. I think the photo Charlotte posted of the Duchess in her Beulah London Sabitri dress is absolutely beautiful. The two dresses are similar, but the Beulah Sabitri dress is a much better colour for her and the details perfect, in my opinion. I am in agreement with many that today’s dress seemed “off” in many ways. I do understand it is her choice, but with such a similar (and beautiful) dress in your closet, why have another made? She is very good at recycling, this would have been an opportunity to wear another of her loveliest dresses again. I agree with you about the Beulah London photo. What makes it even more amasing is that it was taken , I believe, the day that saw the publication of probably the worst moment personally of her royal life. She certainly kept calm and carried on at a time others would have retreated into hiding. It was a tour. There were elaborate plans and many people involved. She could not disappoint. The thought occurred to me: I know many of the Queen's outfits have been preserved for later exhibition. I wonder if we sometimes do not see a dress again because it has been set aside for that purpose? Perhaps wearing this dress that closely resembles the other reminded her (and others) of her ability to put the needs of the monarchy first, as the Queen has done. I don't know if anyone else has made the association between this dress and that event. It seems obvious to me and I mentioned it, knowing the risk of the blatant violation of her privacy by opportunists being once again used to blame her for their actions. The color is lovely but the combo of the design and her hair looks frumpy. Her hair is her signature, but she's nearly 40 and a professional and mother of three - she needs a 'do that doesn't look like she's hanging on to her schooldays!! Ok ladies, has anyone seen Kurt Seyit Ve Sura on Netflix? It’s wonderful, I am on my third time watching. If you are like me and love historical romance, then you will love it. It’s a true story about Russian nobles during revolution, it has subtitles but it’s so good you don’t even realize you are reading them. My point is that to me Kate’s style most resembles old European royality. Her dress would fit right in with royals from 1917. I think her style is beautiful, but sometimes I feel like she doesn’t fully embrace it, she teeters in the line of old/modern. I would actually love for her to adopt some older hairstyles, to me this dress she wore would have looked superb with an updo with a beautiful pearl pin in her hair, just a subtle nod to the old way.... it’s like she is wearing this beautiful old style dress but fails to bring it full circle by under accessorizing, and I understand where more is less, but just think what a pearl bracelet and earrings would have done for this dress, with a clutch with a pearl accent...in fact her hair would have looked great just like the models. This is a classic tea dress - perfect for the occasion! When I watched the video I noticed Kate wasn't there for the music or speeches. I wonder why. She was there on the other side of William. Their side wasn’t as easily seen as the side where Charles was.